Sometimes, all I want ( make that NEED) is a good piece of pizza. 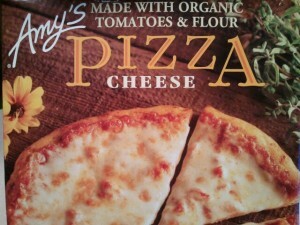 Since I happen to be a fan of Amy’s Kitchen, why not try one of the pizzas? Next, I cut it up into 4 slices, and ate it with some steamed veggies. It wasn’t too greasy looking, so that was a plus for me. The first thing I liked was the crust- nice and doughy, yet a slight crisp on the bottom. The pizza kind of reminded me a Sicilian-style pizza. Doughy, with fresh tasting marinara-like tomato sauce, and a good amount of mozzaralla cheese. The cheese itself was chewy, in a good way, and slightly salty. I really couldn’t believe this was frozen, it tasted just like it would from a pizzeria! Overall, this is pretty much everything I could want in a cheese pizza (besides the fact it didn’t have a 100% whole wheat crust, but this is too delicious to pass up!). 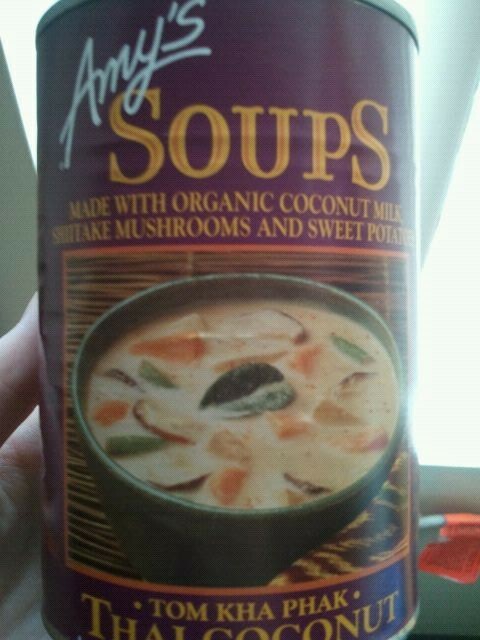 Great flavor, freshness, a good portion size, and made with organic ingredients! 5 stars for sure, and I’m definitely buying it again! 1 pizza (176g) is 420 calories, 17 grams of fat (6 saturated), 49 grams of carbohydrates, 3 grams of fiber, 4 grams of sugar, and 18 grams of protein. What’s your favorite type of pizza to get at a pizzeria? 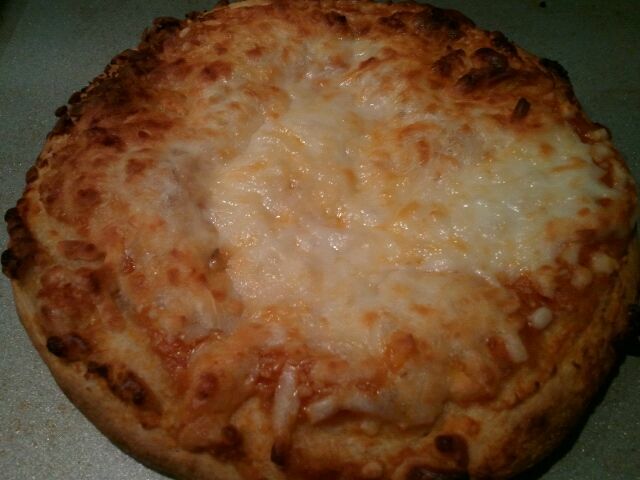 I happen to like good ol’ cheese, but I also like Grandma Style pizza! To start off, unlike any lasagna I ever had, it had breadcrumbs on the top, kind of like baked macaroni & cheese. 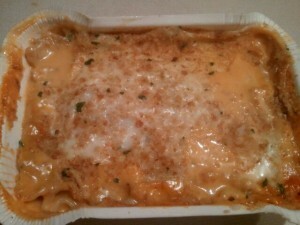 It also had a creamy, cheesy sauce on top, followed by lasanga noodles, veggies, and then marinara sauce on the bottom. First bite, I fell in love. The gooey and cheesy sauce on top had a cheddar flavor, which went so good with the breadcrumbs on top and the noodles. I do wish the breadcrumbs were a bit crunchy, so perhaps I’ll put this on broil in the oven for a few minutes before I eat it in the future. The noodles were chewy and soft, and I saw broccoli, zucchini and the occasional small mushrooms for the vegetables. The veggies were soft, but still had a bite to them, so they weren’t mushy. There was also a bit of a black pepper flavor. The sauce on the bottom tasted fresh, and reminded me of a more traditional lasagna of tomato sauce and cheese with noodles. I noticed throughout the lasanga everything wasn’t dry at all, even a tad bit liquidy. 1 lasagna is 350 calories, 11 grams of fat, 47 grams of carbohydrates, 4 grams of fiber, 9 grams of sugar and 16 grams of protein. What’s your favorite thing to use bread crumbs with? Alrighty. 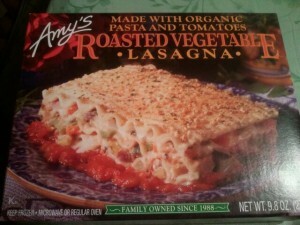 Here goes the Amy’s Kitchen Veggie Loaf Whole Meal review. Ok, so the name isn’t exactly super exciting, but then again I don’t really find the word “loaf” all that exciting either. Anyway, I’m assuming Amy’s Kitchen is taking a veggie stand on meat loaf. 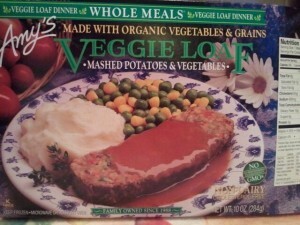 Sooooo in this meal is a veggie loaf with some sort of gravy, peas and corn, and mashed potatoes. After I cooked it, here’s what it looked like. much prettier on the box, indeed. I started with the peas and the corn. 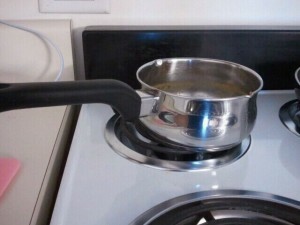 I took a spoonful and almost instantly noticed a texture problem. These were, well, mushy. I was expected them to be crisp, even slightly firm. The taste was really good, but they had a uniform texture- I couldn’t distinguish a kernel of corn from a pea as I chewed it. However, everything was pretty flavorful and the peas were pretty sweet. Next up, the mashed potatoes. I was a bit let down at the portion of the potatoes, as it wasn’t very large. I took a scoop and they were fluffy, slightly pasty, and slightly salty. The taste reminded me of those thick wedged potato fries. Pretty good. Lastly, the loaf. On top was a sweet tomato-flavored sauce/gravy. It wasn’t super sweet, but it wasn’t really salty either. The loaf itself was dense, chewy and had a lot of vegetables in it. I easily detected a black pepper flavor, and some garlic as well. It was a tad bit dry, but not too bad. It’s kind of hard to explain- it was almost like oatmeal and veggies in a loaf shape. Here’s a picture of what a piece looked like. Overall, I actually really enjoyed this meal. It was a light meal, not super filling but substantial, and really quite tasty. It’s a little low on protein, only 9 grams, so I think having a glass of milk or something along the side would be a good option. I also think it’s safe to say I filled my vegetable quota for the day ; ) 4 stars. 1 meal is 290 calories, 8 grams of fat, 47 grams of carbohydrates, 10 grams of fiber, 6 grams of sugar and 9 grams of protein. What’s your preference- Vegetable Loaf or Meat Loaf? First I cooked the meal, 4 1/2 minutes on HIGH and then 2 minutes on 50% power. 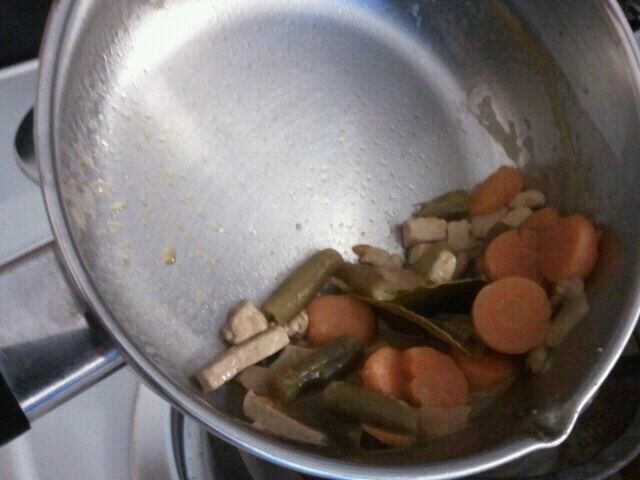 I also added a tablespoon of water after the 4 1/2 minutes to the green beans because they looked like they needed it. We’ll start with the green beans. They actually were surprising to me, usually when I eat green beans they have that bite, or that not-quite-done-yet consistency. These, however, were tender and actually very good. Fresh and soft, but still good. 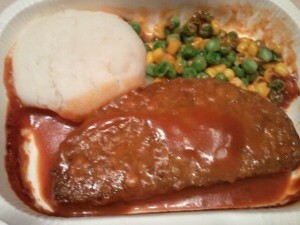 Lastly, the veggie steak and the gravy. First off, the gravy was absolutely delicious. Thick, salty (in a good way), rich and buttery tasting. The perfect gravy! 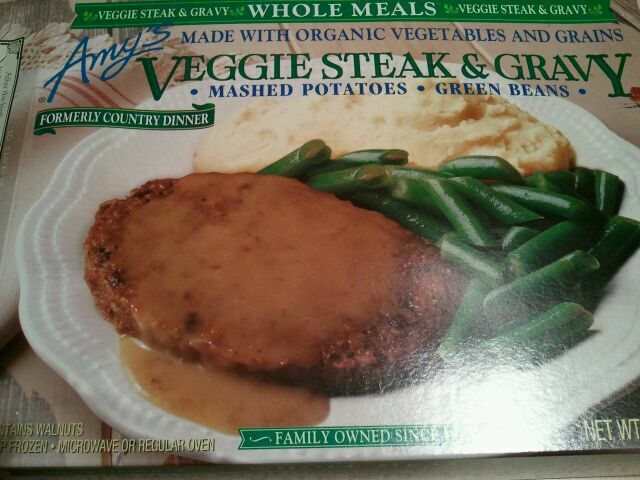 It covered most of the veggie steak, which is kind of hard to explain other than it was delicious. It was very textured, yet soft at the same time. It had vegetables and other things scattered throughout, with an occasional bump that I’m assuming were tiny pieces of walnuts. It was really good. I liked dipping it in the mashed potatoes! Overall, delicious! I felt the mashed potatoes needed a little extra something, but still a good meal.I also thought it was a bit high in saturated fat, but not too bad (7 grams). 4 1/2 stars. 1 meal is 380 calories, 16 grams of fat, 50 grams of carbohydrates, 7 grams of fiber, 7 grams of sugar and 12 grams of protein. What’s your favorite veggie-style product? Ok. I’ve heard excellent things about this dish, and I finally tried it. Seeing as the avid Amy’s Kitchen fan I am, I asked myself why have I NOT tried this yet? I’ll reiterate that I’m not a HUGE fan of pasta, but it’s yummy every now and then. So I steamed up some broccoli (my usual veggie of choice), and made this in the microwave. After stirring up the dish, I was taken aback on how thick and creamy it was. Like almost as if a giant block of cheese was placed on a bed of noodles and left there to melt. Globby, thick, creamy, cheeeeese. I tasted a spoonful, and thought ohh yeaaa. This is some SERIOUS mac and cheese. It had a mild cheddar taste, and no overpowering flavor, but just really good. It did need a sprinkle of salt, I felt it just needed a little bit more, but it was good none-the-less. As I ate my meal, the mac & cheese thickened up, and it was almost like a thick, cheese paste on the chewy yet tender noodles. Tasted just like baked macaroni and cheese that was simmering in the oven for quite some time, yet was available much more quickly due to the microwave. Overall, 4 1/2 stars. Deeeeeeeeelish. 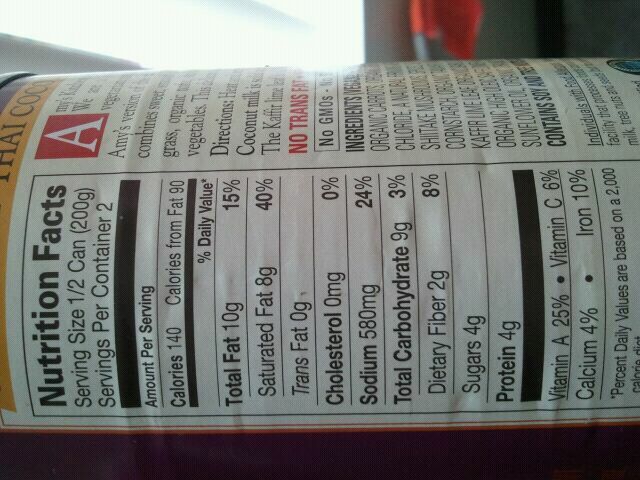 My only complaint was that it was high in saturated fat (10 grams!! 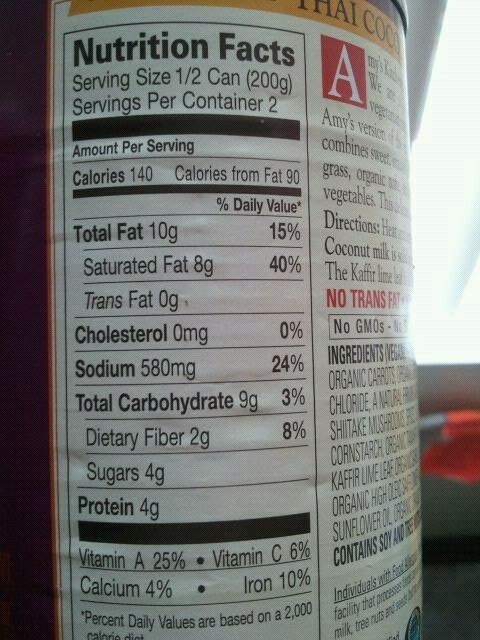 ), and low in fiber (only 3 grams). Otherwise, give me this dish and some steamed broccoli and I’m good to go! 1 container is 410 calories, 16 grams of fat, 47 grams of carbohydrates, 3 grams of fiber, 6 grams of sugar and 16 grams of protein. 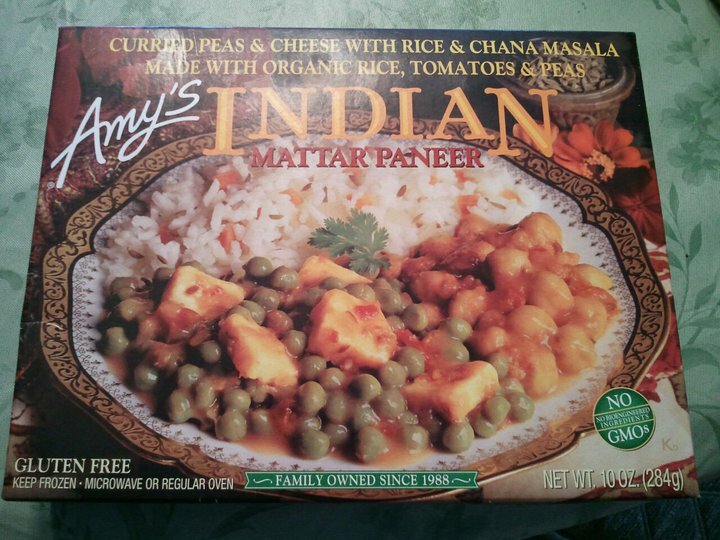 Amy’s Kitchen has yet to let me down when I have tried their meals in the past, and they certainly didn’t let me down with the Indian Mattar Paneer. Although I have had comments from people about the spicy smell that floods the kitchen (sorry!! ), this meal is too good to pass up. The box says it’s “curried peas & cheese with rice & chana masala” and also “made with organic rice, tomatoes & peas”. And on another note, this meal is ALSO gluten free! So after cooking this meal, there was basically 3 sections. One with peas with indian cheese, one with chana masala, and one with rice. Starting with the peas and cheese, at first I didn’t see any cheese. It was buried underneath the peas, but after a quick stir, rather large pieces of cheese emerged. 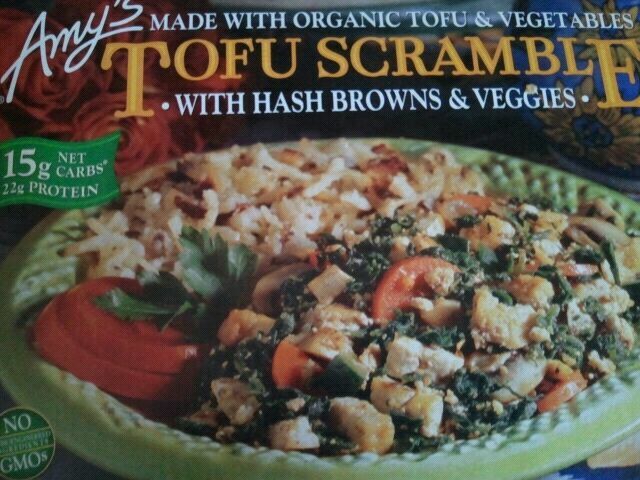 I thought it was tofu actually, until I tasted it. I don’t even know what Indian Cheese is…BUT IT’S SO GOOD! And I don’t even LIKE cheese! It was creamy, slightly chewy, almost like a thick cream cheese. The cheese was resting on the peas, firm but well cooked, and rather spicy actually. Great flavor. Moving on to the chana masala, another thing I’m not entirely sure what it is, but the back of the box said it was “organic garbanzo beans and sweet organic tomatoes”. The beans were soft, and the tomatoes were more of a sauce than actual chunks of tomatoes. Lastly, the rice. 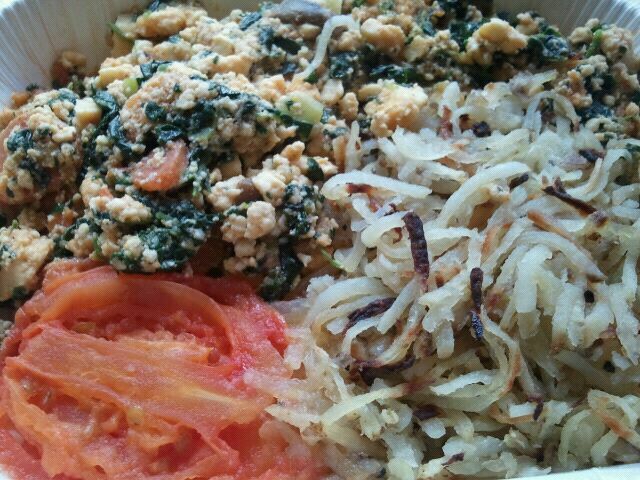 I don’t know how Amy’s does it, but the basmati rice is sooooo. gooood. 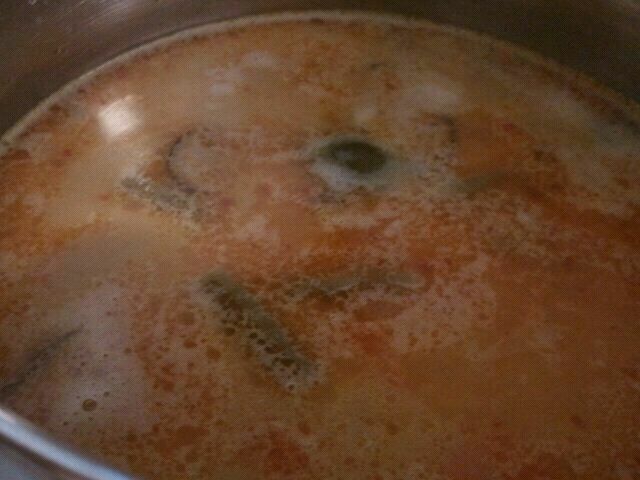 Super fluffy, with baby bits of carrots, and tiny pieces of cumin. 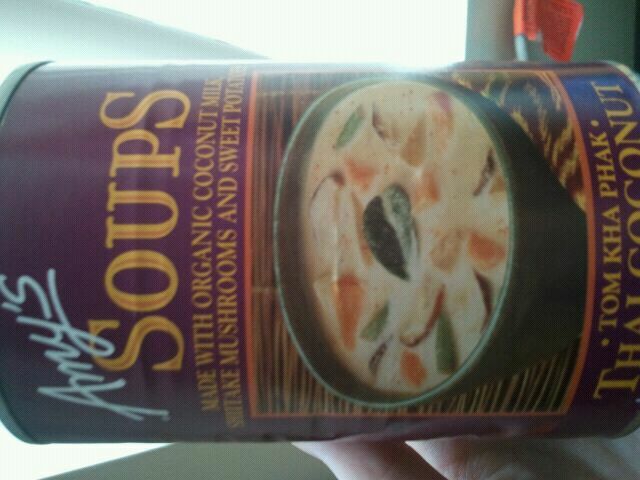 Even though it’s not overpoweringly flavorful by itself, it’s still really good! My second favorite part of the meal (who me? A carb queen? Like rice? Pshh…), aside from the cheese. Overall, a great meal. Great spiced flavor (and I can’t tolerate spicy things well- so this one was just perfectly spiced in my opinion!) I just had a side of steamed broccoli to up the veggie intake, and I was perfectly satisfied with eating this. 5 stars. 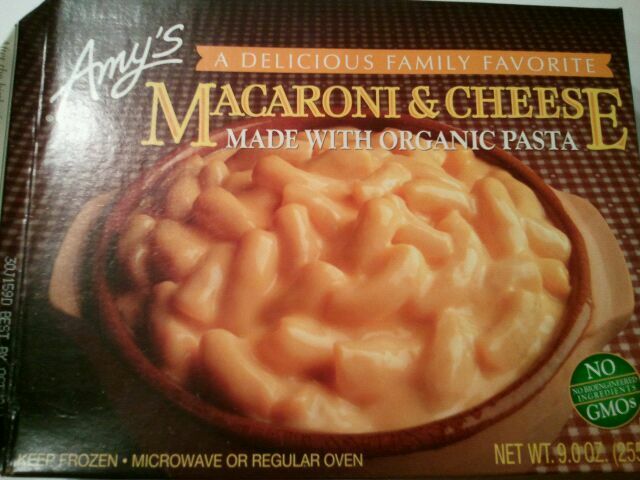 What’s your favorite Amy’s dish? 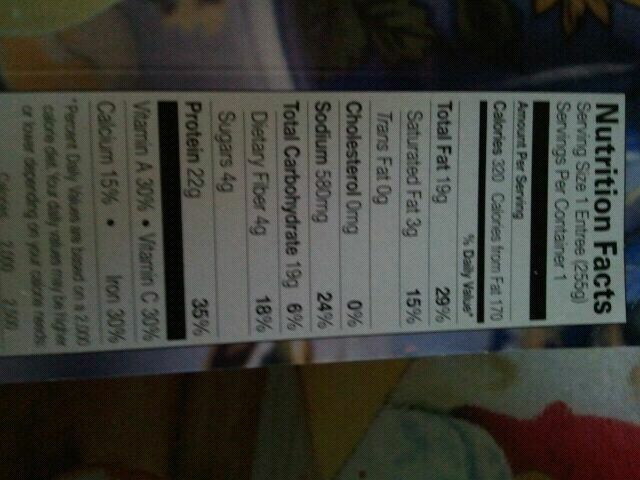 1 meal is 370 calories, 11 grams of fat, 54 carbohydrates, 6 grams of fiber, 8 grams of sugar, 13 grams of protein. 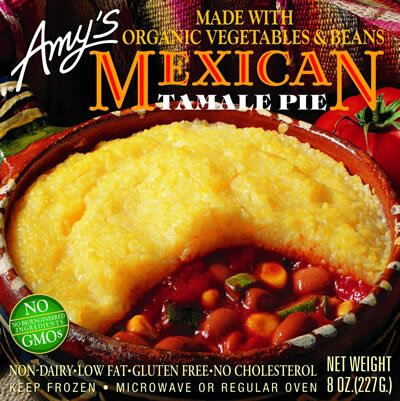 Amy’s Kitchen has the perfect combination of mexican flavor and the comfort that a homemade pot pie can bring with their Mexican Tamale Pie. 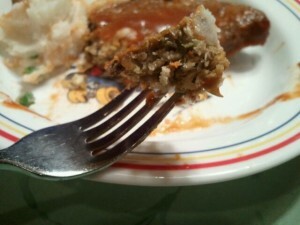 What is a Mexican Tamale Pie? you ask. Well, according to Amy’s Kitchen it is “Organic beans and vegetables in a lightly spiced Mexican sauce with a golden polenta topping.” It’s also gluten and dairy free, and only 3 grams of fat. So, I was certainly interested in this little pie as I was strolling the grocery aisles. 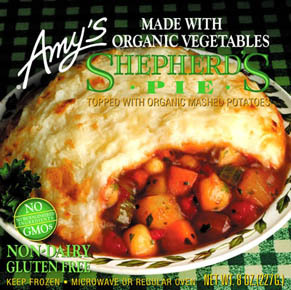 I decided to give it a shot- I love Amy’s, I love pot pies, and I love her mexican line- how could I go wrong? This pie was so cute! It was bursting with corn, zucchini and little tomatoes, as well as some pinto beans. The pinto beans were nice and tender too, not mushy at all. The sauce that the veggies were had just a hint of spice, but had mostly a tomato & garlic/onion flavor. It was delicious! My favorite part, of course, was the polenta on top. It’s not as thick as depicted on the box, but it was soft and smooth, with a mild corn flavor. I added just a grind of sea salt on top of the polenta and it was AMAZING how much the flavor came out (I know, I shouldn’t add salt to frozen meals..but it was just a little! 😀 ). I especially loved the crispy edges from the microwave. 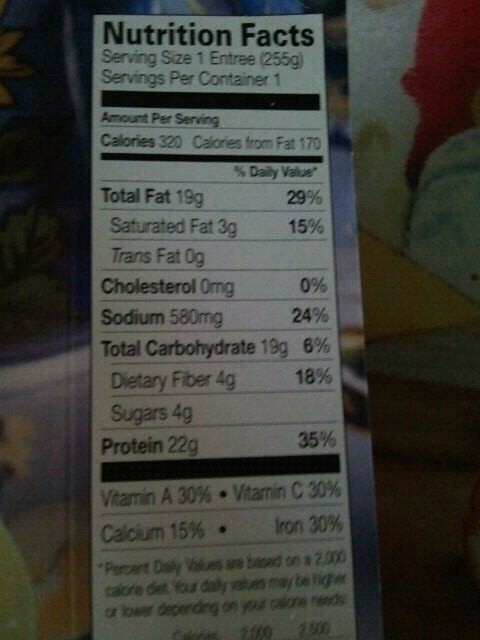 1 pie is 150 calories, 3 grams of fat, 27 carbohydrates, 4 grams of fiber and 5 grams of protein. FILTERED WATER, ORGANIC PINTO BEANS, ORGANIC TOMATO PUREE, ORGANIC CORN, ORGANIC ZUCCHINI, ORGANIC ONIONS, ORGANIC CORNMEAL, ORGANIC SWEET RICE FLOUR, EXPELLER PRESSED HIGH OLEIC SAFFLOWER OIL, CILANTRO, SEA SALT, SPICES, ORGANIC GARLIC.